I remember the first time I did a Blue Note LP search: I used the auctions only option, my eye nearly popped out of my head. When I noticed the sickening prices some of the original first press Blue Note LP's were fetching on eBay, I became demoralized. Many well over $500, and now some of those same records are bringing in well over $1000, and many up and beyond $3,000. Keep in mind, records that are selling for such high prices are top copies, the record and covers will be in excellent to near mint condition. They will be original first pressings and many times they will have been play tested as well. It was discouraging to say the least, a man such as myself with a modest income, could only dream of being able to afford records like these. Because of my cheep-skate approach, I have been able to find many of these titles as second or third pressings. 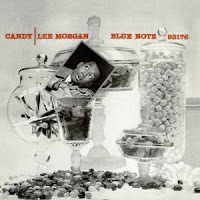 Prices keep rising Many of Lee Morgan's original pressings are now topping $3,000, many of the Blue Notes featuring cover art from the iconic pop culture artist Andy Warhol are also rising fast in price. But, nothing prepared me for an $11,000 Blue Note eBay auction. 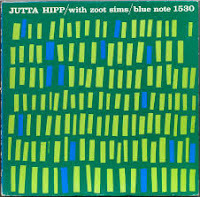 This record from the German Born Jutta Hipp broke the $5,000 mark on eBay in 2005, Jutta was a pianist who primarily played cool jazz and be-bop, she was also a painter of some note. This album with Saxophonist Zoot Sims is considered her best, along with one of her other records for Blue Note Live at the Hickory House. Both records are very rare and highly sought after Blue Notes. Jutta completely disappeared from the jazz scene as the 50's came to an end. Until the 2000 Blue Note didn't know where to send Jutta's royalty checks, but apparently she did receive a $40.000 check before her death. She was never married but did have one son. This session from 1956 is a straight ahead cool jazz session that shows Jutta a quite original pianist in the bop tradition. Zoom Sims also plays his heart out. It was quite a surprised when a copy of this sold for as high as it did. I believe it nearly doubled in price at the time. Altoist John Jenkins is one of the many who had potential and didn't quite gain the heights he should have. Completely out of jazz by 1963 only to resurface in the early 90's for a while before his death. A copy of this session on Blue Note recently sold for more than 4,000, incredible price for what I consider a dead average session. 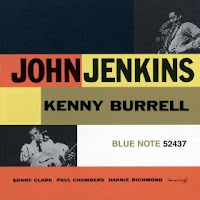 Jenkins was a capable player, but owed a great debt to Charlie Parker, and Jackie McLean, The music is good but not great. Update: A recent March 2012 auction for this title surprisingly brought less than $900, not sure what the reason was for the price drop. A copy of Candy recently topped the $3,000 mark, an unusual album cover to say the least. A quartet session from Lee Morgan, with only his trumpet along with a piano trio. Still only 19 at the time. It is startling how mature his trumpet sound. Morgan fuses elements of Clifford Brown, Morgan's main influence, and now Mile Davis and Dizzy Gillespie influences are creeping in. The ability to play so confident at such a young age is what's amazing on Candy. Lee Morgan would develop into one of the greatest trumpeters in jazz history with his nearly 15 year run on the label before his death in 1972 at the age of 33. Lee Morgan was murdered on stage at Slug's Saloon by his ex-wife Helen More, she spent only 6 years in prison before being paroled in 1978. Here we have a classic Jackie McLean late 50's session, Swing Swang Swingin', a fantastic quartet session of mostly standards. McLean is deep into his Charlie Parker sound, long before the free bop style became a focal point. McLean has a piss and vinegar tone on alto, nothing sweet about it, but on this session his tone does seem to soften a bit. The entire album has such an authentic vibe, McLean really digs into the melodies of the the standards and make them his own. An original Pressing of Swing Swang Swingin' with a 47 West 63rd address is rising fast in value, up over a $1,000 for a NM copy. All original McLean Blue Notes are rising fast, I am beginning to think that later pressings of different titles, like some of the early to mid 60's NY USA label originals from McLean and other artists, are going to be breaking a thousand sooner rather than later. Despite the high auction prices you can still be a Blue Note collector Don't let these ridiculous high-roller prices discourage you from being a Blue Note collector. You can still collect the above mentioned Japanese re-issues, or even the American 70's "black b" Liberty Blue Notes, which by the way still sound fantastic to my ears. Many other re-issues are available at different price points. The 45 RPM double albums are said to be spectacular full body stereo remasters of the original tapes. Many will tell you that the ultra cheap DMM's are not worth bothering with, but I can tell you many a DMM Blue Note resides in my collection. The sound is not as harsh and brittle as I was led to believe, or I just can't hear what they hear? It's a matter of taste, you need to find out what taste you have. Again, Compact Discs and downloads might be a fit for you. In the end, it's all about this wonderful music, and perhaps not nearly as much about sound quality as many an audiophile will proselytize. If you want to get a good start at understanding the finer points of Blue Note record label identification, check out this article on the subject.